2) I neglected to mention this website recently passed its 11th birthday on Feb. 22. That’s in part because I made such a wreck of the 10th birthday bash, neglecting to make it all the way down the ‘top 10’ countdown as promised. Shameful. But I haven’t stopped doing this. Shortly after I return next week, the website will be freshly updated with a new look & feel I’d been working on for the last month with the crack team at Crooked Number. The changes — necessitated mainly by an upgrade of the operating system that would make the current look go kablooey — may look plain at first, but is much more powerful beneath the hood and is only a start. 3) I first got this question a few years ago, and didn’t know what to say then or now: What will the Bat Boys be wearing in 2010? As I recall the history, Met bat boys went numberless until 1986 (maybe 85?) and have in most years worn the figure of the year — except in 1999 when they skipped ahead to 00 so as not to mess with Turk Wendell’s mojo. Despite the second-straight curious spring training issue to Andy Green, it seems as if No. 10 will be available this year, but I’m thinking maybe 00 might be better. I’ve never been a fan of the ‘BB’ designation some teams use and I’d hate to see it here. Thoughts? 4) I’m again happy to have been asked to contribute an article for the 2010 Maple Street Press Mets Annual, which is arriving on area newsstands now. 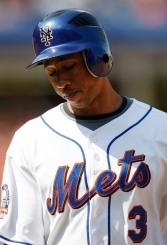 My contribution — a look at 2009’s injuries and their place in team history, got a terrific boost from longtime MBTN contributor Jason E., whose comprehensive history of the Mets disabled list made it all work. Did you know who the all-time leader for separate trips to the disabled list is? What body part has been injured most often? Who was the first Met ever to go on the DL? Then pick this thing up now. Also, there’s good articles. 5) We’re scheduling another Amazin’ Tuesday March 23 at Two Boots Tavern on the Lower East Side. Deets to come. 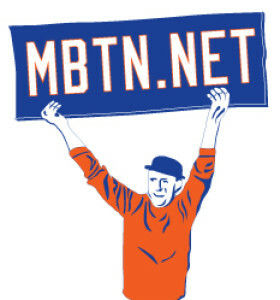 My friend Dave reports the buzz on the Intenets suggests the Mets will unveil their new uniform designs on Friday, Nov. 27. For those of you dreading the worst, that day is also known as “Black Friday” and the official kick off to the Holiday shopping season. It’s also a week before the Winter Meetings get underway. That the home pinstripe unis will shift from a bright-white to cream color is the worst kept secretof this event. What might be more interesting to track is whether those jerseys will retain the unnecessary black accents that the current jerseys do, and whatever other changes might be in store. I’ve been tipped off that certain influential people in the Mets organization are strongly in favor of a new alternate look — that is, to balance to the “retro” look of the cream pinstripes — as well as subtle chages to the current ensemble including the removal of piping on the plackets of the home whites. 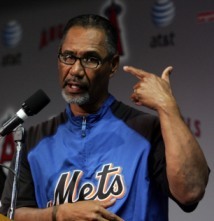 That would allow the Mets to further resemble to Dodgers, but if you’re going to copy an NL team, you could do worse. Do you think this addition might mean they cashier the all-black look or would they dare mix and match four looks? I dunno. And I wish they’d come to realize the two-tone hat is just awful and derserved to die years ago already. Pictured here are a few of the alterna-prototypes the Mets asked season-ticket holders to consider earlier this year. What do you think? Many of you are probably aware the Mets will take the field against the Giants this weekend wearing “throwback” jersey that pay tribute to the Mets’ National League predecessors. The cream-colored jerseys with the oversized NY logo recall the New York Giants unis of 1904-1907 and invite fans to imagine Bobby Parnell and Jerry Manuel as if they were Christy Matthewson and John McGraw. I have no problem with the Mets playing a game or two each year with a commemorative jersey, it’s the kind of thing the team doesn’t do nearly enough of which is surprising given the opportunity for merchandising that fuels the Wilpon powerplant. The Mets have also made a point to inform fans they finally got around to Metting up the new place, hanging up a few new photos and banners. I wonder how the Great Wall of Famous Former Met Signatures is coming along? I will see on Monday. Anyhow, while you peruse the throwbacks this weekend, keep in mind the near certainty that a new look is en route next season, and that this outfit, though seemingly a throwback, is also a likely barometer of the future. 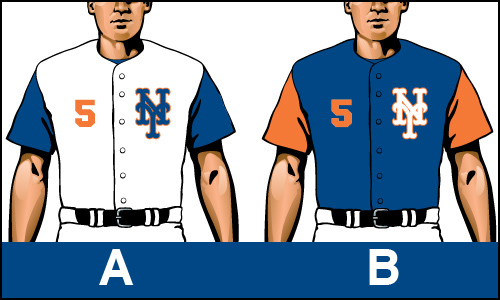 Remember that the Mets asked fans about a cream-colored home jersey, removing trim on the placket, and an oversized NY logo on the breast (check, check and check). I would not be surprised to see all three elements incorporated in some fashion next season — at least one influential Met insider I know of is strongly in favor of it. This is also a good time to point out a running tabulation of Met results by Uni Style as tracked from across the Atlantic by Checked Swing. Home whites/blue caps are killing the competition, trim or — bet on it next year — no trim. 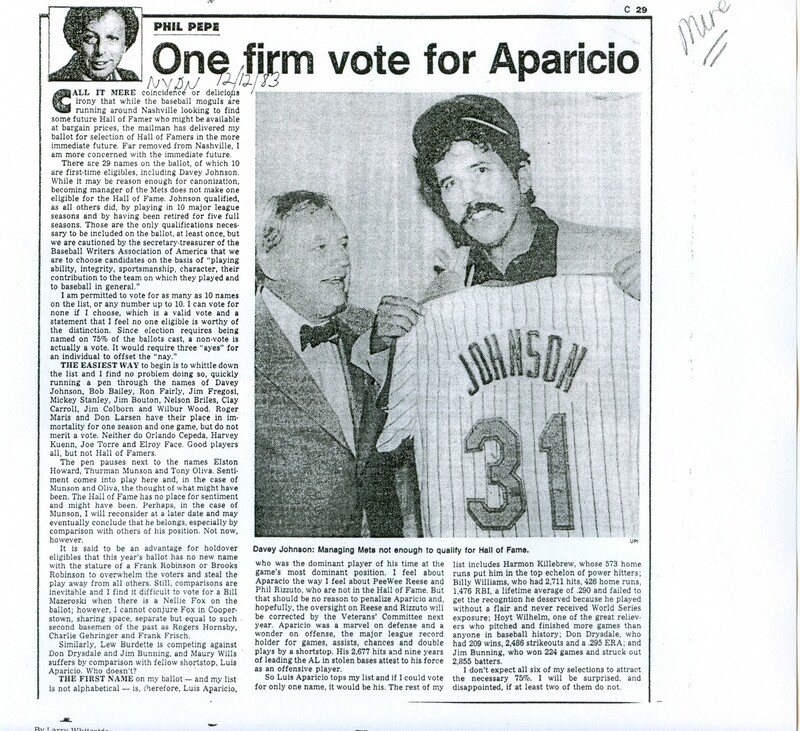 MBTN reader Matt today sent along a scan of a 1983 Daily News article showing the accompanying photograph of Davey Johnson posing with jersey No. 31. As we all know, by the time Johnson managed his first game with the Mets in April of 1984, the 31 jersey was long gone and Johnson would wear No. 5. Although the article this story accompanied (click the photo to see it) appeared in a December of 1983 and concerned Johnson’s eligibility for the Hall of Fame, the photo itself was taken that October, on the day the Mets introduced Johnson as their next manager. This was an interesting find though. I’ve got copies of Newsday, the Times and the Post from that day, all of which used the same closeup of Johnson’s face to illustrate their stories. But it’s not unprecendented. 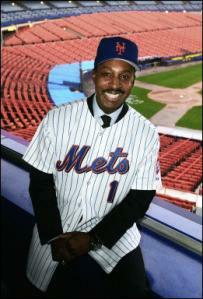 Back in 2004, on the November day the Mets introduced another new manager, Willie Randolph, they presented him with jersey No. 1 and not the 12 he’d show up in once it was time to play. Similar photo-op phollies struck Mets-in-waiting like Roger Cedeno (11 in the press conference, 19 on the field); Xavier Nady (10; 22), Duaner Sanchez (40; 50); and Chad Bradford (35; 53). Which brings me to an interesting discovery I made while fleeing a rain delay earlier this season at the new park. Ducking into a Promenade-level memorabilia shop to avoid the downpour I came across (not literally) a selection of “game-used” jerseys from scrubs of the not-so-distant past, selling at the relative bargain price of $100 each. Among the KNIGHT 28s (Brandon, not Ray) and SOSA 29s I spied this curiousity: An alleged “game-worn” No. 17 belonging to Willie Collazo, whose short Met career already included one interesting moment in uni history. Collazo, who was up briefly in 2007 and 2008 (but did not play in the latter appearance) was issued No. 36 in both stays, so the 17 was out of place. I didn’t think to check whether there were any clues as to what year the jersey was from, but my records show that during Collazo’s entire tenure with the Mets, the 17 jersey would have been available only in the month of April 2008, after David Newhan was gone but before Fernando Tatis had arrived (and even then, Tatis had 17 assigned to him). Any theories as to how this happened? And what other cases can you recall where a Met was issued a number but never appeared in it? Don’t look now but the Mets are finally getting around to considering changes to their uniforms. And not all good ones, it looks like. Some friends at the Crane Pool Forum passed along this online survey that I encourage you to take. 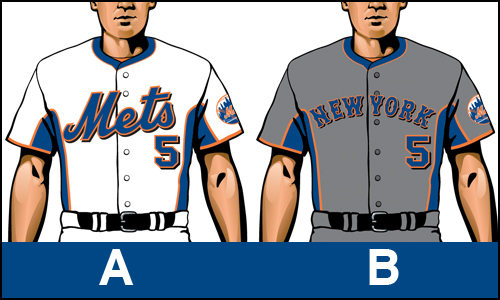 The Mets appear to be toying with the idea of dropping black (probably eight years too late, but they’ve never been too quick on the uptake) and seem to want opinions on keeping or removing the trim around the buttons and collars (I find myself divided depending on the look) and on white vs. off-white. They also look fairly determined to introduce a radical “alternate” next season, perhaps a version of the vest above, or, please God, no, the nauseating armpit-racing-stripe overdesign below. I’m an admirer of the Mets traditional look but not as hostile as some to changing it up now and again.And I’d certainly prefer to see them mix in the tradional orange-and-blue into any design they come up with, so if they’re going to go with something new next year, give me Vest A, I guess. They’ve also been kind enough to ask, in so many words, how offensive you find the appalling lack of Met character at the new ballpark. There’s a space for comments, please remark upon the astonishing lack of a Mets Hall of Fame there and encourage them to build one and then name me the curator. What are your opinions? I’m especially interested to hear your thoughts on the theoretical alternates. 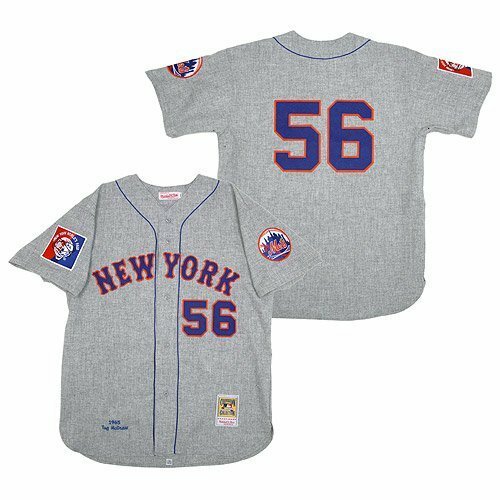 Quick question….noticed that Mitchell & Ness created a 1965 Tug McGraw replica jersey with number 56 on the back … I checked with your site and noticed that McGraw never wore that number. While I guess it is possible that M&N created a replica spring training jersey (they’ve done that with St. Patrick’s Day jerseys), it seems odd for them to do so (they could have produced a McGraw with the more familiar 45 and still included the World’s Fair patch). Any idea what M&N was thinking? As I told Steve, I’m not entirely sure but would guess they’d made a simple mistake. I seem to recall a photo of Tug appearing in 56 make its way into circulation through a yearbook or baseball card from that era, and it was not at all unusual for those shots to be taken during spring training. Further research led me to a discussion forum here where for what it’s worth, a writer says they checked with Mitchell & Ness who confirmed their replica is based on a spring training model. You’d think for $275 bucks you’d get the real thing but jerseys ain’t my cup of meat. Just what McGraw was doing in any number in 1965 has always been a little more intriguing a mystery. After all he was only 20 years old then, and wouldn’t stick in the majors to stay until 1969. The answer has to do with the way baseball’s rules treated first-year players at the time: In an effort to put an artificial drag on bonuses, those players not promoted to the big-league club after their first year were subject to a special draft. With the Mets still early in the talent-assembly game they took no chances. McGraw was among five 1964 signees who cracked the team in 1965. Ron Swoboda, 21; Kevin Collins, 19; Danny Napoleon, 23; and Jim Bethke, 18, were the others. McGraw, whose developing screwball brought him surprising early success, would return to the development pipeline — and wait out military service requirements and injuries — before arriving for good. And though he was always in No. 45, the Mets reissued the No. 45 jersey twice during the periods following McGraw’s debut: In 1966 for Darryl Sutherland and in 1968 for Bill Connors. Good read in Sunday’s Daily News catching up with Jon Matlack, the hard-throwing, hard-luck lefty of the 1970s. I remember Matlack as a master of broken bats who threw hard inside stuff, didn’t walk many, and could ring up the whiffs: It’s a mystery he wasn’t more successful. Turns out you can’t trust everything you read on the Internet. Who knew? The below item about rumors of a uniform change was shot down this week by a source in the know. Not only are the Mets not ditching road greys for charcoal greys, but the black will continue to be an (unwelcome) element in caps, drop shadows and jerseys. The only changes, our source assured us, will be a sleeve patchadvertising Citibank honoring CitiField, and the removal of the black road NEW YORK jerseys from the lineup, allowing the team to suit up in the same black Mets jerseys at home or on the road. 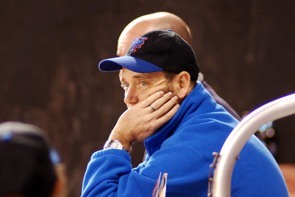 (The photo here, snapped by the talented David Whitham, catches your host digesting the Mets’ inability to get the winning run home from third base with no outs in what became my final visit to Shea Stadium last month. We really oughta dispense with the moroseness now, and ditching the black — all of us — seems a fine way to start. I’m going to go set that hat on fire). Very disappointing knowing that changes could be coming to the Mets ensemble had been an open secret since 2006, when Paul Lukas’s spirited but ultimately doomed Ditch The Blackcampaign got some publicity but no results.